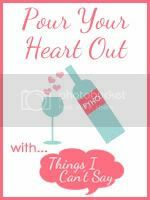 I'm joining in on Pour Your Heart Out at my friend Shell's place. Head over and check out some of the other posts, and if you have something you need to get off your chest, join in! I've always thought of myself as "open-minded." I believe that there are at least 2 sides to every story, and there are exceptions to every rule. I think everyone has a story, and it's not our place to be their judge. I'm Pro-choice. I believe women have the right to choose what happens to their own body, but abortion should not be a means of birth control. I have a hard time not being judgemental of a woman that can tell you prior to getting pregnant that if it ever happened she would get an abortion. Really?! that's your plan?! How about using any of the number of preconception birth control methods?! Hell, use them all! Abortion should not be an easy decision. It should not be your "plan." Even as someone that is firmly pro-choice, I also firmly believe that abortion is ending a life, but, sometimes it is the right choice to make. Just as euthanizing a sick pet is clearly taking a life, it is, sometimes, the right choice.It should however, be the last choice, not the first! Now, I know that this goes completely against being an "open-minded" person. In fact, it makes me a more judgemental person than I would have ever have wanted to admit. But, I'm admitting it: I'm judgemental! I have an opinion, and as hard as I try, I can't help but look at someone differently when they made such a decision so easily. When they knew in advance that it was the decision they would make, and yet, they did nothing to prevent having to make that decision. It's her body, her choice, but, it's not a choice I would have made. But, then, I'm not that person. In my life, that choice was never even a consideration and thankfully so. I'm pro-choice, I just wish more people would choose life. I believe much the same as you. It should never just be a form of birth control. It's heartbreaking to hear of people who have that plan in mind before they even get pregnant. I feel the same way. It breaks my heart. There are so many people out there who can't get pregnant or have a family and then there are those women who use this without thinking. Makes me sad. Really sad. I feel strongly that abortion is ending a life, and I'm pretty conservative in this dept. I try very hard not to judge anyone for thier decisions. I have no idea what their circumstances are. That being said, a life is a life and adoption is always an option. There are many couples who depend on adoption to build their familes. I agree with you that it is heartbreaking to hear of abortion treated as a means of BC. It's horrible. I am pro choice as well (but then im also very liberal). I agree with what you wrote here. Too many people use abortion as the simple solution and fool proof back up plan. I wish people would be more educated on abortion and on the mental toll it could take on someone. Women (especially young women) see abortion as the solution to a "problem" yet they don't think about the problems that it will cause them. Ive had 3 friends have apparitions and every one of them had depression and mental struggles right after. So 1) Women shouldnt use abortion as a BC or a back up plan and 2) If they do get an aborion they should understand it better and have mandated counseling to deal with the after effects. Finlly I think there should be a limit on how many abortions someone can have ... I knew of someone that had 6 abortions. WTF.